Bistrița ([ˈbistrit͡sa]; German: Bistritz, archaic Nösen; Hungarian: Beszterce) is the capital city of Bistrița-Năsăud County, in northern Transylvania, Romania. It is situated on the Bistrița River. The city has a population of approximately 70,000 inhabitants, and it administers six villages: Ghinda (Windau; Vinda), Sărata (Salz; Sófalva), Sigmir (Schönbirk; Szépnyír), Slătinița (Pintak; Pinták), Unirea (Wallendorf; Aldorf) and Viișoara (Heidendorf; Besenyő). The town was named after the Bistrița River, whose name comes from the Slavic word bystrica meaning "fast-moving water". The earliest sign of settlement in the area of Bistrița is in Neolithic remains. The Turkic Pechenegs settled the area in 12th century following attacks of the Cumans. Transylvanian Saxons settled the area in 1206 and called the region "Nösnerland". A large part of settlers were fugitives, convicts and poor people looking for lands and opportunities. The destruction of Markt Nosa ("Market Nösen") under the Mongols of central Europe is described in a document from 1241. Situated on several trade routes, Bistrița became a flourishing medieval trading post. Bistrița became a free royal town in 1330. In 1353 it gained the right to organize an annual 15-day fair, as well as a seal containing the coat of arms of an ostrich with a horseshoe in its beak. In 1465, the city's fortifications had 18 defensive towers and bastions defended by the local guilds. It was also defended by a Kirchenburg, or fortified church. The town was badly damaged by fire five times between 1836 and 1850. The church suffered from fire in 1857, when the tower's roof and the bells were destroyed. The roof was rebuilt after several years. Fires in the nineteenth century also destroyed much of the city's medieval citadel. A Jewish community developed in Bistrița after the prohibition on Jewish settlement there was lifted in 1848. The community was Orthodox with a strong Hasidic section, but there were also Jews who adopted German and Hungarian culture. A Zionist youth organization, Ivriyah, was founded in Bistrița in 1901 by Nissan Kahan, who corresponded with Theodor Herzl and there was significant support for the Zionist movement in the town between the two world wars. A large yeshivah flourished under the direction of the rabbi of Bistrița, Solomon Zalman Ullmann, in the first part of the twentieth century. The city was part of the Austro-Hungarian Empire until 1918. On December 1 that year, Transylvania united with Romania, and Romanian Army troops entered Bistrița on December 5. The city reverted to Hungarian control between 1940 and 1944 and was reintegrated, with all of Northern Transylvania, into Romania after World War II. During World War II, the Hungarian authorities deported several dozen Jewish families in 1941 from Bistrița to Kamenets-Podolski in the Ukraine, where they were killed by Hungarian soldiers. The Jews of Bistrița, as elsewhere in Hungary, were subjected to restrictions, and Jewish men of military age were drafted for forced labor service. In May 1944, the Jewish population was forced into the Bistrița ghetto, set up at Stamboli Farm, about two miles from the city. The ghetto consisted of a number of barracks and pigsties. At its peak, the ghetto held close to 6,000 Jews, including those brought in from the neighboring communities in Beszterce-Naszód County. Among these were the Jews of Borgóbeszterce, Borgóprund, Galacfalva, Kisilva, Marosborgó, Nagyilva, Nagysajó, Naszód, Óradna, and Romoly. The ghetto was liquidated with the deportation of its inhabitants to Auschwitz in two transports on June 2 and 6, 1944. On June 11, 2008, the tower and roof of the church caught fire when three children who went to steal copper set it on fire while playing. The main part of the church suffered just a little damage and is not in much danger, the interior being intact. It is speculated that both bells residing in the tower (one dating from the 15th century, the other from the 17th) might have melted. The population of the city numbered 9,100 in 1891, of whom 718 (8%) were Jews; 12,155 in 1900, of whom 1,316 (11%) were Jews; 14,128 in 1930, of whom 2,198 (16%) were Jews; and 16,282 in 1941, of whom 2,358 (14%) were Jews. In 1947 1,300 Jews resettled in Bistrița, including survivors from the extermination camps, former residents of neighboring villages, and others liberated from the Nazi concentration camps. Given continuing discrimination and unfavorable political conditions, the Jewish population declined steadily as a result of emigration to Israel, the United States, and Canada. By 2002, only about 15 Jews lived in the city. The main attraction of Bistrița's central square is the Lutheran church, which was built by the Transylvanian Saxons and originally constructed in the 14th century in Gothic style. Between 1559–1563 it was altered by Petrus Italus and given Renaissance features. It was renovated in 1998. The Bistrița-Năsăud County Museum, located in a former barracks, contains Thracian, Celtic, and German artifacts. The city's two leading high schools are Andrei Mureșanu National College and Liviu Rebreanu National College. In Bram Stoker's novel Dracula, the character Jonathan Harker visits Bistrița (rendered as "Bistritz", the German name for the city, in the original text) and stays at the Golden Krone Hotel (Romanian: Coroana de Aur); although no such hotel existed when the novel was written, a hotel of the same name has since been built. In the PlayStation 2 game Shadow Hearts, Bistrița (where it is spelled "Biztritz") was a major place and home to the role-playing character Keith Valentine. The major cities directly linked by trains to this city are Bucharest via a night train, and Cluj-Napoca via several trains. Access from Bistrița to major railway lines is generally through connections in Dej or Beclean, although some other trains stop at the nearby railway junction of Sărățel. Bistrița also serves as a midway point for C&I, a transport service, and is a changing point for people traveling between Suceava, Satu Mare, Cluj-Napoca, Sibiu, Sighișoara, Târgu Mureș, and Brașov. 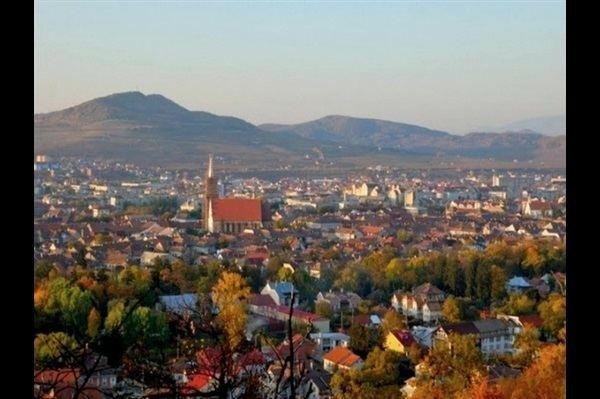 Nearest airport is Cluj-Napoca Airport, which is located 110 kilometres (68 miles). from Bistrița.